I was in the desert over the weekend, and when I turned my phone back on there was a message showing that a friend of mine had altered the Adidas store "Defining Venice" sign to read "Defacing Venice". She (because all the best protesters these days are women) put paper over the glass, so no damage was done, and the point was not only made, but applauded. By the time I got back, it was already taken down, but the completely insulting and totally audacious Adidas one was not. They're dumb. Shout out also to Skylark, who has a great "Already Defined (but Thanks)" sign in their window across the street. This very blog was started because I wanted to tell the stories of those people, places, and events that have helped to define Venice over the years. To share the many story tiles of our Community that make up the entire beautifully diverse mosaic that is our home. I walked by Great Western Hoagie today when I was out and about, and remembered how much I love this mural on the side of their little hut that I also love. 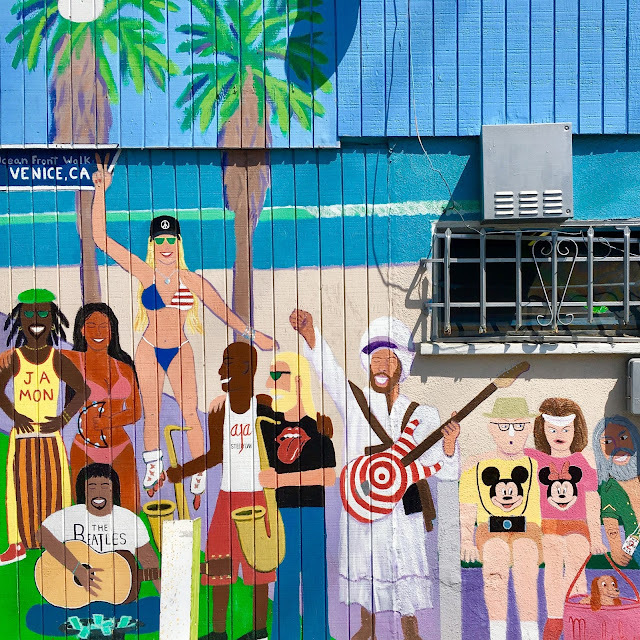 This mural made up of true Venice definers (after the one like it at the beach). I don't see one apparent tech person (there's a uniform), one apparent billionaire (because anyone might be in Venice, but it's cooler not to act like it), or any Adidas. Curious. Please always feel free to suggest subjects for me to explore. There are so, so many cool nouns (persons/places/things) to discover in Venice, it's hard for me to keep up! Thank you for that still being the case, everyone that is still cool! Love you.